I was sitting on my couch watching TV, debating on what to make for lunch. I am tired of snacking, and I wanted a dish that was filling and healthy. I went to my refrigerator and found nothing appealing. I went to the pantry and found quinoa. I haven’t had that in a while. 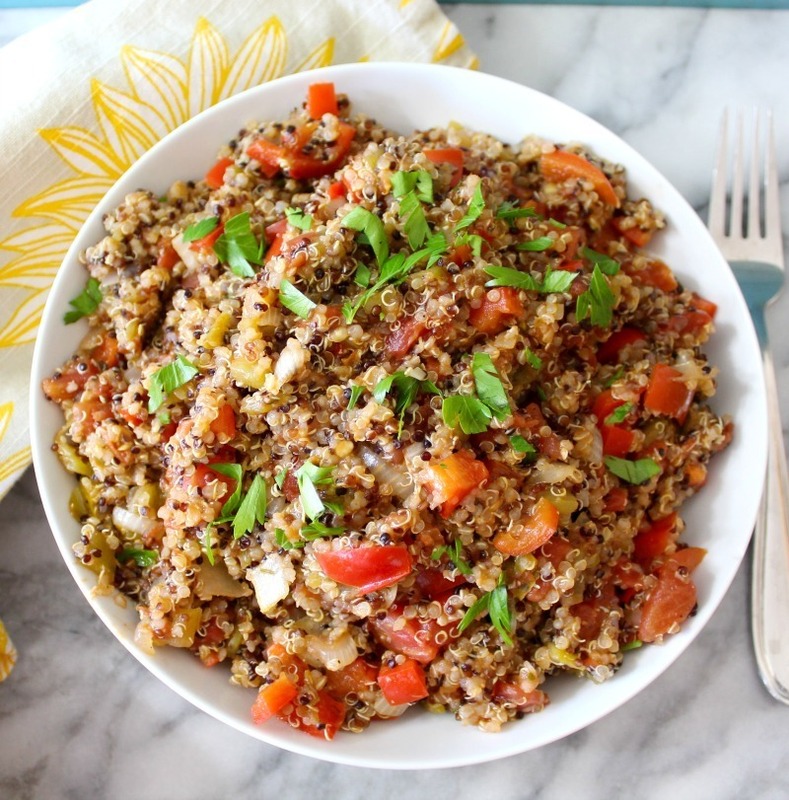 I dug through the rest of my pantry and I found the right staple items to make myself a quinoa dish that I will love. 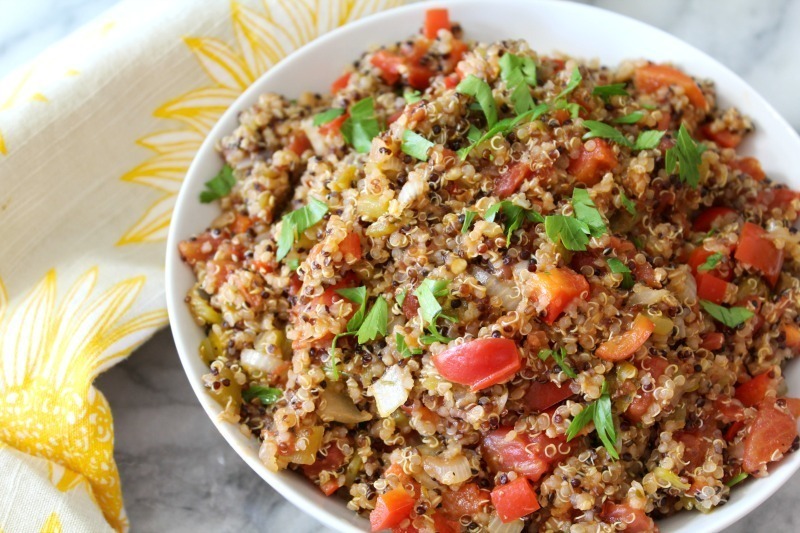 Today I am sharing with you my new creation, Quinoa with Peppers and Onions. This dish is just amazing. It tastes like a combination of Stuffed Peppers and Chili. If you love stuffed peppers, you will love this recipe. It doesn’t have too much heat, but has a nice smokey flavor, but it also has a southwestern flair. I think that comes from the cumin that I added. For this recipe I did use pantry staples, which makes for an inexpensive, easy meal. For fresh ingredients I used onion, sweet bell pepper and parsley for color. I am glad to find the pepper hidden in the fridge. 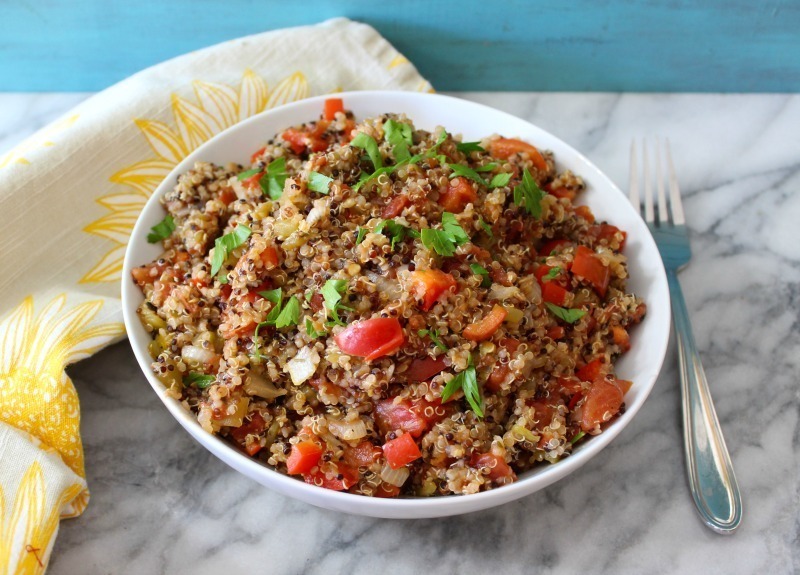 For the pantry items, I used quinoa of course, canned green chilies, and canned diced tomatoes. The rest is all seasoning. Nothing fancy, just the basics. I am sure you have most of these ingredients in your pantry. I made this recipe for my lunch and since it makes 6 cups, I now have lunch to take to work for the rest of the week. It tastes great cold or warmed up. When it sits, the flavors really come together. Tastes even better the next day. I am just loving this dish. I was thinking, this would taste great in a stuffed pepper or even on tacos. So many things you could do with this recipe. 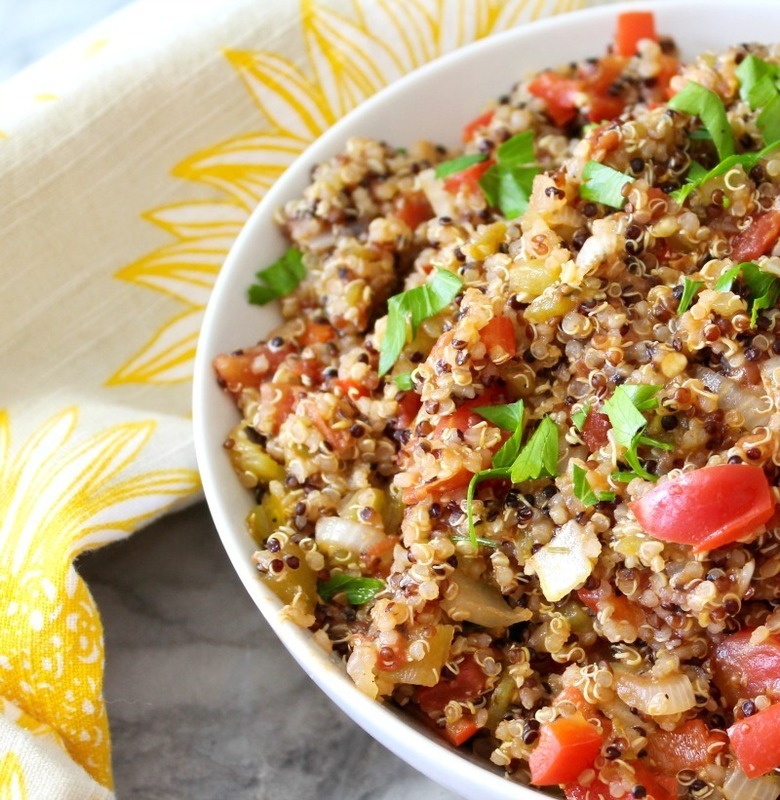 If you haven’t had quinoa yet, you must give it a try. It really absorbs the flavors of anything you add with it. 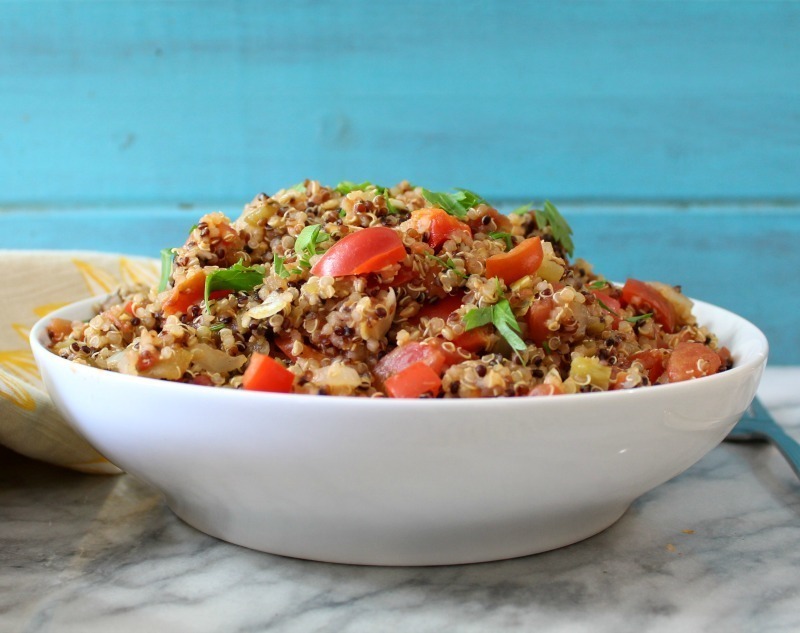 If you are not a fan of quinoa, you could always make this recipe with rice. 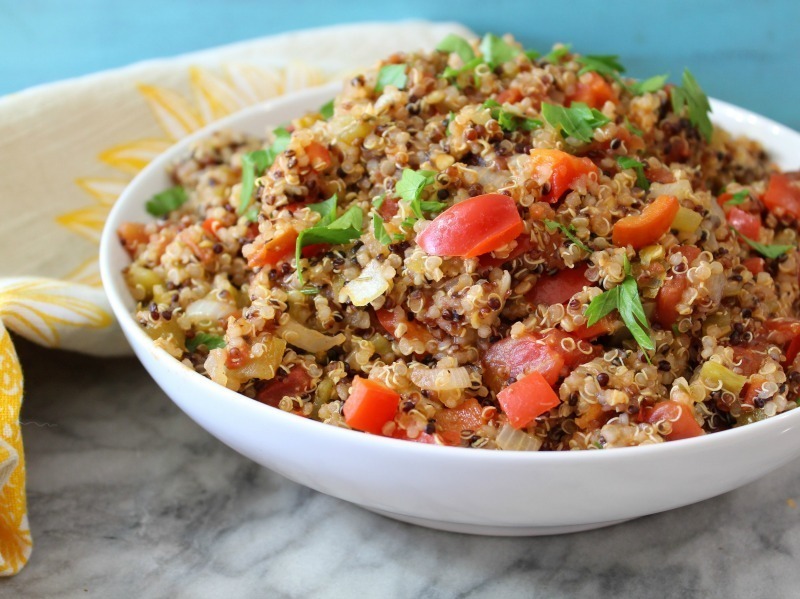 A healthy vegetarian quinoa dish that tastes like a mix between a stuffed pepper and chili. It has a slightly smokey flavor with a southwestern flair. It is great for lunches! Rinse quinoa. In a medium sauce pan, add quinoa and water. Bring to a boil; cover and simmer for 10 - 15 minutes, until water is evaporated. Mix occasionally. Meanwhile; In a large skillet add olive oil, and warm for 30 seconds. Add onion and cook for about 2 minutes until softened. Add garlic and sweet bell pepper and cook until pepper is tender; about 3 minutes. Add chilies, tomatoes, salt, and ground pepper. Mix well. Bring to a boil, and lower heat to simmer. Add chili powder, cumin and oregano. Cook for about 5 minutes; stirring occasionally. Turn off heat and add quinoa. Mix until well combined. Taste test it to see if you need more salt. Pour into serving bowl and top with fresh parsley. I love when you come up with random recipes that is easy to make and has so much flavor. I am looking so forward to having lunch tomorrow. However, I may sneak a few forkfuls before then. Perfect for tomorrows’ office lunch! thank you ! Tried. Succeeded. Great ! Keep on rocking ! Awesome! I am so glad it turned out for you. Thank you for letting me know. 🙂 You made my day.